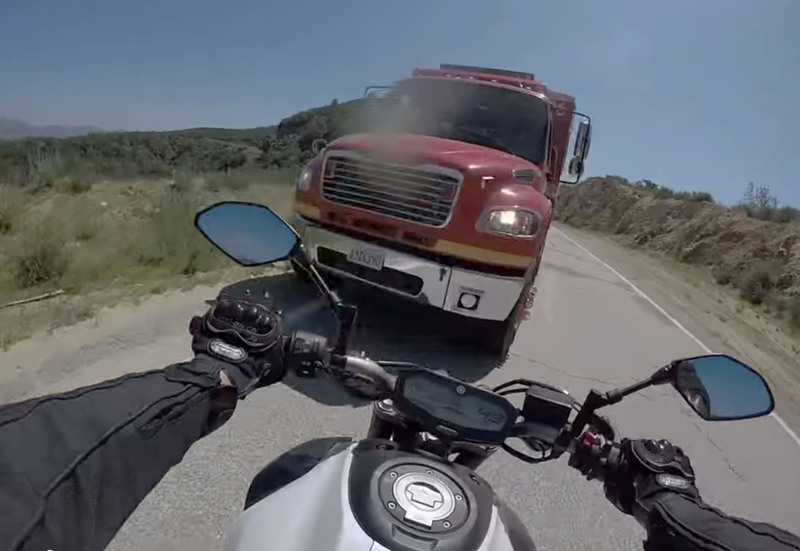 A head-on Los Angles motorcycle crash with a fire truck was captured by the rider’s helmet mounted GoPro camera. The incident took place April 1, 2015 but the footage was not posted publicly to YouTube until June 5, 2015. The rider, 24-year-old Jesse Lopez, was riding his Yamaha FZ-07 on Glendora Ridge Road back in Angeles National Forest. The video shows him winding his way on the road when, after coming around a blind turn, he finds himself headed straight on with a Los Angeles county firetruck. Lopez makes a clear struggle to reposition the bike once he sees the firetruck, but he fails to avoid what appeared in the video to surely be a fatal impact. Miraculously, Lopez survived the incident with multiple compound fractures and a broken arm. The video shows him conscious following the incident. Of course the footage also incited a large amount of discussion, much of it from riders who believe they know better. No doubt, this incident will serve as a firsthand perspective what it’s like running into a 65,000 lbs firetruck at high speed on a motorcycle. Surely it will be in the back of my head when entering a blind turn at speed. The Los Angeles motorcycle lawyers here at RiderzLaw wish a speedy recovery to Mr. Lopez, and urge all our readers to take this video as a warning to ride safely and within speeds relative to your line of sight.